Read to know how you can trade the budget month of February and March 2016. Vega (VIX) will increase so buying options may be profitable. The Budget session of Parliament will commence from February 23, 2016 and the government will present the General Budget on February 29, 2016. Expiry day is on February 25, 2016. Many a times, stock market makers will postpone the February expiry date to the budget day to help traders make the most of the budget day. Unfortunately it only helps traders trade more and lose more. Not sure if they are going to do that again this year and I hope they don’t, but for now 25th is the expiry date. If they extend the expiry day, I will inform you. So even though the expiry happens in February, there will be interesting things happening in March Expiry as well. It is is around 25 now, and I am quite sure until the budget is over this is NOT going to fall very much. May be it will be in a range from 22-25. But as the budget day approaches it may well be near 30. People who buy options, February is the only month that favors you. VIX doesn’t fall. Huge volatility in markets. What more do you want? Note for traders who have done my course. With 10-20% of your trading capital, you can try going long with options. You can trade Long Straddles or Long Strangles. If you do not know what is a long straddle, then its buying of both Call and Puts Options of the same strike (usually traders buy ATM (At The Money) options), same quantity (no. of lots) and same expiry and waiting for a big movement. In the Long Strangle the trader can buy any strike call and any strike put option (usually out of the money (OTM) options are bought). In Long Strangle too number of lots bought remains same and the expiry also remains same. Please note that payoff will differ in both the strategies. Long Straddle will almost always outperform the profits from the Long Strangle. The reason being the trader is taking more risk by paying more premium, why shouldn’t they make more for the same move? There is a technical reason as well, and that is the movement will take at least one of the options In The Money (ITM). Since the other side’s premium will not melt fast due to increasing VIX, it minimizes the effect of theta (time) on options, thus overall profits can be huge. Warning: Movement has to come to make a profit in long straddles and strangle. But risk is low this month as premiums will not see a sudden drop. And we all know movement will come in the budget month. Since VIX will not fall, its quite easy to assume that the options premium will not evaporate fast. And if the options premium will not evaporate fast, a movement of even 1% can bring great results. Please remember to square your positions Intraday (within the same day) or within a max of 3 days, no more. One day or the other theta will have to effect the premiums, irrespective of the increasing volatility, and so it gets dangerous to stay more than 3 days in a long straddle or strangle. 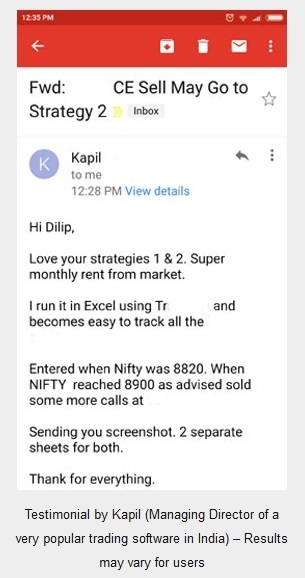 Do not trade long strangles of FEB 2016 expiry during the last 5 trading days of this month. Vega will fall very fast due to lack of time – no amount of increasing VIX will help. During the last five days, shift to the March month expiry. That is all trades taken on or after 22 FEB must be shifted to March expiry. Please also note that on the day of the budget, VIX will fall swiftly as its being read, so its very important to stop trading positional long strangles or straddles one day before the budget day, that is 26th of February, 2016. What To Trade On The Budget 2016 Day? On the budget day, trade the long straddle only and Intraday only. Huge swings will ensure huge profits. Sometimes 100 points down, sometimes 100 points up, but you target 20-30 points and exit. Do not trade again once you book profits. Take the day off and enjoy. Don’t even look at the markets. If time permits I will write another email on how to trade on the budget day. If you are an Intra day trader I would suggest Long Straddle because in a few hours premiums will not erode and Nifty movement will bring huge profits. Remember that this is applicable to this month only and till budget day. After that long strangle or straddle will become very dangerous to trade. VIX will drop pretty fast taking away all the premiums. After budget these kinds of trades will lose money. That does not mean Short Straddles or Strangles will become profitable. If you are planning to wait for a bigger move, its better to trade the Long Strangle as your risk will reduce when you buy out of the money options. You can leave long strangles overnight. Once the budget is over – VIX will fall swiftly and within a few days will start trading in a narrow range making both the long as well as short straddle difficult to trade. So this advice is valid only until the budget 2016 is over. For the long straddle there is nothing to be told. You can buy Call and Put Options At The Money (ATM). If trading Intraday, Long Straddle works great if VIX is increasing. 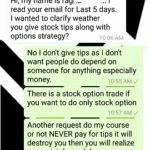 If you are planning to hold the options overnight then the strike prices you chose becomes extremely important. I would suggest not risking a total of 100 points on one lot trade. So basically the total points you may risk from both the call and put should NOT increase 100 points or Rs. 7500 per lot CE and PE. If its 2 lot 15,000 is at risk. Fact is its notional loss. 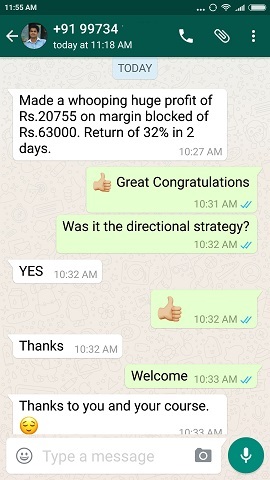 We will look at a profit of 20-30 points that is 20% to 30% return on the long options. OR exit at 30 points loss. VIX will not fall fast. So a combined loss of 30 points in 3 days looks very difficult. And for sure due to Volatility there will be a big move once in 3 days. There you go. That day when the total points of CE and PE exceeds 120-130 odd points – click the sell button on both. Though the possibility of reversal is very high during high volatility times – its a huge risk to get off one side of the trade thus making huge profits and waiting for a reversal. If Nifty does not reverse, then that 20 point profit may go down the drain. Why are Puts costlier than Calls during high Volatility Time? Right now, do you notice the difference between At The Money Call and Puts premiums? The reason is pretty simple. During high volatility times there is fear in the markets. The high net worth individuals and institutional investors have stocks worth crores and its a must that they save their portfolio from going down in value in case there is a severe crash. The only way to protect their portfolio is to buy Puts. Market makers know this. So to make sure that the markets remain a level playing filed for all, they make the Puts costly. Please note that its not done manually. The software controlling options premium knows important event dates and acts accordingly. You see if during these times if Puts are not costly, who will sell puts? For example right now there is panic in markets, can you sell naked puts even 200 points out of the money? So until and unless I am paid pretty well to sell puts I won’t sell. And if there are no sellers, there can’t be any buyers and trading halts. Market makers do not want this to happen, so its obvious Puts will explode in value. During normal times getting less premium is ok. But when the risk is high why shouldn’t the put sellers get more money to sell these dangerous options. If puts are not priced high, no one would dare to sell them and the whole market place would stop trading. Also not that as time passes, Puts will get even more costly compared to the Calls. Until of course the budget. The calls also needs to increased in prices, though not as big as puts just to make sure there is parity in pricing of the options. Experienced traders can trade calendar spreads. These are spreads where the trader sells options this month and buys far month options. It does not matter which far month – but in this situation its better to be long in March options and Short in February 2016 options. That’s because Calendar Spreads are Long Vega (Volatility). Now its pretty simple to understand that VIX is not going to fall until 29th of this month. However February options have to expire on 25th only. Now whatever the VIX, even 60, on the expiry day it has to become NIL by 3.25 pm. But VEGA of next month options cannot expire so they keep the VIX of 60. Do you get the point? This situation can be exploited beautifully trading the the Calendar Spreads. So the trade is SELL an OTM (Out Of Money) Call Option expiring February 2016, and buy the same strike Call Option March 2016. Similarly SELL an OTM (Out Of Money) Put Option expiring February 2016, and buy the same strike Put Option March 2016. Keep an eye an exit at reasonable profits. Warning: Calendar Spreads are for experienced traders. Its not an easy trade. My course has much better and easier trades than this. These spreads work great when next month Vega will increase and current month Vega may drop or get finished by expiry. As you can see, this is the only month in the year when we are sure of that. The other months Calendar Spreads may not work. Well for most, budget trading is not a easy trading. Most people who sell options lose big time during this month and they don’t know why. Reason is huge movements like you saw today and an increase in volatility. I am sure a lot of option sellers lost a lot of money today. That’s the reason my emphasis on hedging. If you lose small money it won’t pinch. Imagine losing months of profits in a single day’s trade. That’s not something you want. 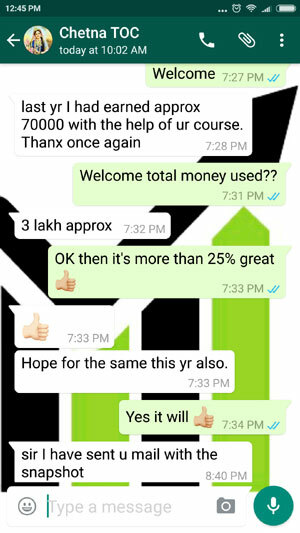 My course will teach you better hedging techniques and also strategies that can help you make money from the stock markets peacefully. 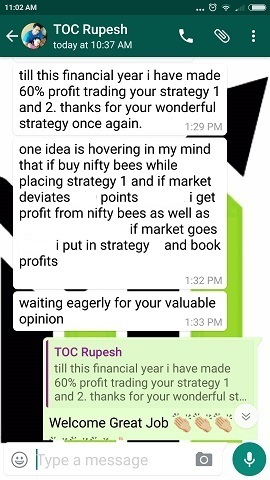 I don’t promise a lot, like others do, but I can only say that after one year of trading my strategies you will be in good profits. Isn’t it better than losing money trying to make too much money from trading? You decide. Please do ask questions in the comments section below. Is there an arbitrage opportunity in options this month since the there may be a mispricing in put and call prices ? How to utilise the opportunity ? I think I have already written an article on arbitrage opportunities in stock markets. You can find it here. Trying to do arbitrage through options is a difficult task, and any difficult task must be avoided. So right now is the correct time to buy stock in cash and sell its Futures for a guaranteed profit. This month there is going to be too much volatility and therefore cash and future arbitrage will work much better. In the calendar spread, should the Mar long position be closed before 29th Feb. since premium will come down after budget. Good Question. The Calender Spread will expire on February Expiry i.e on 25th Feb 2016. Both the trades of Feb Sell and Mar Buy should be closed on the expiry day preferably before 12 pm. After that VIX will start dropping very fast. Thanks. Hedging is when you place a trade against the original trade to “reduce” or limit the losses by the original trade. Hedging should be done at the same time the original trade took place, otherwise hedging can never be effective.